SALEM, Ohio — The number of permits issued for new shale wells continues to drop, not just in Ohio, but in West Virginia and Pennsylvania as well. To show how much the drilling and well permitting is slowing down, take a look at Bradford County where the shale boom began in 2008. The Pennsylvania Department of Environmental Protection issued just three permits during September in Bradford County, compared to 36 in September 2014. There were 12 permits issued in Bradford County in August and 30 in June. The DEP reports a total of 201 wells permitted in the county since the beginning of January. The DEP also reported there were seven wells drilled there during September and 42 wells have been drilled in Bradford County since the beginning of the year. In West Virginia, the permits by the Department of Environmental Protection also declined: The DEP issued only five shale permits in September. 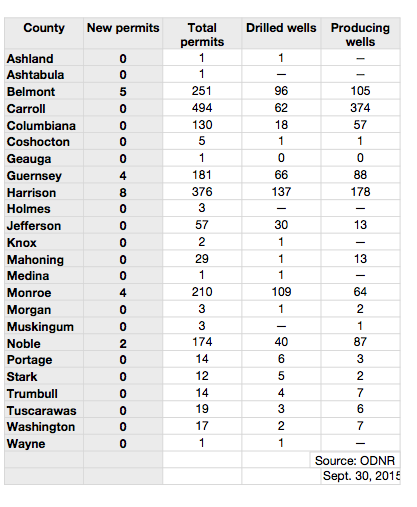 And in Ohio, there were only 23 Utica shale permits issued and no Marcellus shale permits issued in September. Eight permits for Utica shale wells in Harrison County were granted during September, according to the Ohio Department of Natural Resources, the most for any Ohio county. Five of the permits were issued for a well pad in Cadiz Township and will be drilled by Hess Ohio Development. Three of the permits were issued to Hess for a well site in Athens Township. As of the end of September, there were 178 producing wells in Harrison County, 137 additional wells either drilled or in some other stage, and 376 total permits issued since the shale boom began. The ODNR issued five new permits in Belmont County. Two permits were issued in Wheeling Township to Ascent Resources Utica, and two were issued in Pultney Township to XTO Energy Inc. A single permit was issued in York Township to XTO Energy. To date, the ODNR has issued a total of 251 permits in Belmont County, where there are now 105 producing wells and an additional 96 wells in some sort of drilling phase or awaiting infrastructure. Four permits were issued in both Guernsey and Monroe counties during September. The Guernsey County permits were issued to Ascent Resources Utica for a well to be drilled in Londonderry Township. There are now 88 producing wells and 66 additional wells drilled in Guernsey County. The four Monroe County permits are for wells to be drilled in Seneca Township by Antero Resources Corporation. So far, there are 64 producing wells and 109 wells drilled, awaiting infrastructure. Last month, the ODNR issued Antero Resources Corporation two new permits for wells in Wayne Township, Noble County. According to the ODNR, there are 87 producing wells and 40 other wells drilled in Noble County. As of Sept. 30, 2015, a total of 2,017 Utica shale wells have been permitted in Ohio, and 1,598 of those permits have resulted in shale wells being drilled. The ODNR reports there are 21 drilling rigs in the Utica shale as of Sept. 30. In the Marcellus shale, the ODNR reported no new permits issued in September. As of Sept. 30, there were no rigs drilling new wells in the Marcellus shale in Ohio either. So far, there are 43 permits for wells in the Marcellus shale, 19 producing wells and 27 wells have been drilled. Butler County led Pennsylvania with the most permits for shale wells issued during September. The Pennsylvania Department of Environmental Protection issued 15 permits for Butler County and three wells were drilled. Since Jan. 1, the DEP has issued a total of 107 well permits and 69 shale wells have been drilled there. Greene County continues to be one of the busier Pennsylvania counties for shale well drilling. The DEP issued 10 permits during September and 232 have been issued since January. Drilling, however, was down in September with only 11 wells drilled in September and 86 wells drilled since the beginning of the year. The DEP issued three new permits in Beaver County for new shale gas wells, and, as of Sept. 30, there were 28 permits issued for shale wells in Beaver County. There were no new wells drilled in September, which means the number of wells drilled in the county in 2015 stands at five. The DEP reported there were four permits issued during September and 228 permits issued since Jan. 1. It’s no surprise that drilling was also down in Washington County during September with only six wells drilled. There have been 117 wells drilled in Washington County in 2015. Two permits were issued for wells in Lawrence County during September. So far in 2015, 28 permits have been issued in the county, which included 17 for a combination of oil and gas wells, nine gas wells and two that were for multiple well bore type. The DEP also reported there were two shale wells drilled in September and a total of three have been drilled this year. The West Virginia DEP also showed a decrease in the number of permits issued for both the Marcellus and Utica shale during September. In Ohio County, the DEP issued two Marcellus shale permits to the SWN Production Company for two separate well pads with two different surface owners. In Monongalia County, the DEP also issued two permits to Northeast Natural Energy, for drilling on the same well pad. Tyler County, which has been a hotbed for Utica shale drilling, also showed a slowdown. The DEP issued just one permit in Tyler County during September, a permit issued to Jay-bee Oil and Gas.